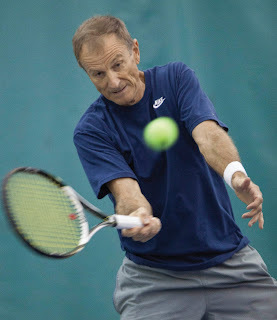 Duty calls tennis champ from National Seniors Game. The consolation match to determine the bronze medal winner was scheduled, but Houston, who is the commander of the dental program at the base, had to return to Columbia to welcome a new set of soldiers who were beginning a residency program the next day. The two opponents tried to move the match up, but schedules could not be coordinated, and Houston had to reluctantly leave Cleveland forfeiting the match." We would love receiving similar stories from you about your part of the Tennis World. Buy 3 Pairs of Socks and Get a 4th Pair for Free at Newbalance.com!